Open is not open. Closed is not closed. It can only exist next to each other. Relativity was my starting point for this project. 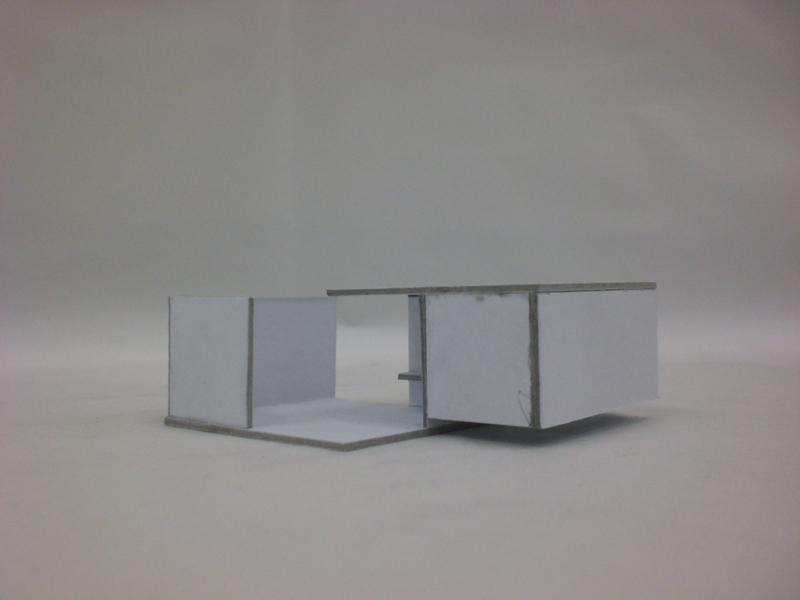 I wanted to create a space or building that existed out of an open and a closed area. By doing this it would be a building for everybody and every moment. It would be a contrast between introvert and extrovert. A place where you can be alone and with people. Where you can play and think. A very nice thought but how to do this? 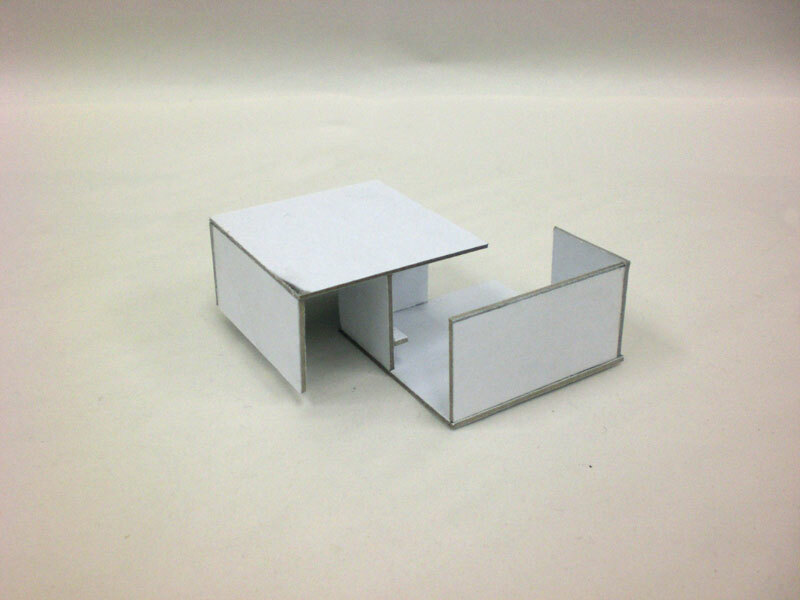 I started with making 3D sketches out of cardboard. While doing that I tried not to plan to much. I had relativity in the back of my head and just started to make things that interested me or forms that I thought were strong. I did this till I had enough sketches and ideas. Then I put al the good ideas together and made a very complex building that was on one site a sort of bunker and on the other side an very open place. There where to much forms in it, so the starting point of relativity was far away. One of the sketches (witch I didn't used) was a very simple form of two squares who overlapped in the middle, by doing this I had created two rooms. Because the squares where turned, the one room had no roof and the other did. This was a very simple way of making use of an open and a closed area. There where still some problems, The closed area was open on two sides so people can walk trough, this would create to much dynamics for a room witch suppose to be an closed room. The open area had still two walls so you didn't have a view witch is very important for an open area. There was a very simple solution for this, I just cut one of the walls of the open area in half and put it on one of the exits of the closed area. Because I started to work with squares this fitted precisely.In the open area you can look at the sky and in the closed area you can look at the grass. There was only one problem, because I closed one of the exits in the closed room there was no light in there and I couldn't make windows because the room would be to open. So I cut the lower part of the two outer walls away. Now there comes light from underneath. The focus lies now on the grass and there is light but not to much. There still have to be a bench in every room. I decided to place the bench of the open area in front of the open space so you have a view from there. The bench of the closed area I decided to put on the wall witch I closed of the area with, so that it is in the corner where it is the most quit. By putting the benches this way it also supports the symmetric form of the building. 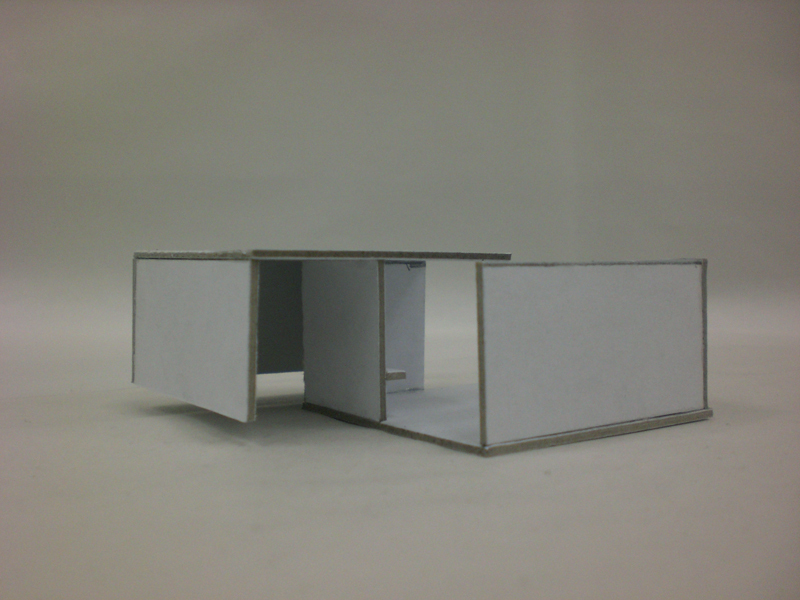 Now I created a building made out of two parts: an open and a closed one. In the open one you can can see the sky and people can walk trough so there is a lot of dynamic there. The closed one haves only one entrance and exit so you can't walk trough. Your walking on grass and there is not much light. I have made a contrast between an introvert an a extrovert area. The building shows the relativity between the two.